It is shown that the discrete spectrum of the Dirichlet problem for the Laplacian on the union of two mutually perpendicular circular cylinders consists of a single eigenvalue, while the homogeneous problem with a threshold value of the spectral parameter has no bounded solutions. As a consequence, an adequate one-dimensional model of a square lattice of thin quantum waveguides is presented and the asymptotic behavior of the spectral bands and lacunas (zones of wave transmission and deceleration) and the oscillatory processes they generate is described. Original Russian Text © F.L. 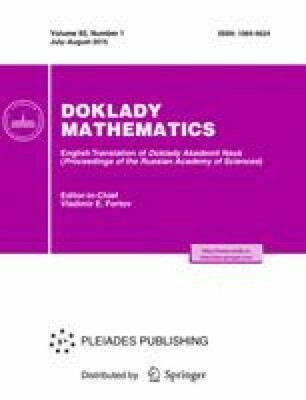 Bakharev, S.G. Matveenko, S.A. Nazarov, 2015, published in Doklady Akademii Nauk, 2015, Vol. 463, No. 6, pp. 650–654.